And have a theme night as well... Just geek out. 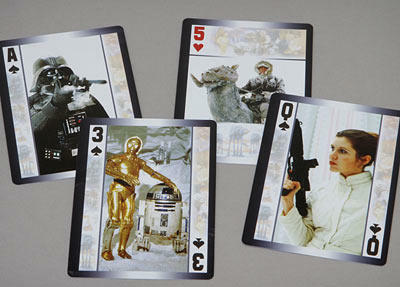 - Each player brings a deck of cards. 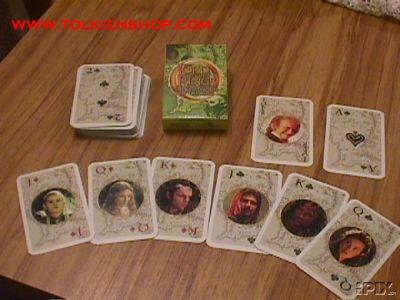 - Each player picks out the spades from the deck and places the them from Ace to King, thirteen cards, in front of them on a table. - The remaining cards, including up to two Jokers, are place in the common card pile. - The common card pile is now shuffled. - Now each player puts eight glasses with something in it on the cards in front of him/her leaving five empty cards. - The first player, either the oldest or the one you are celebrating picks the top card from the common card pile. Red card: If there is a glass on your cards matching the number on the card (1-13), drink it, and place the glass down again, if the glass was empty, turn that glass upside down, this glass now doesn't count as a glass, this is just for counting..
Red card: If the card is empty, and the player clockwise from you has a glass on that card, take that glass, drink it, and put it down on your card, if the glass was empty, turn that glass upside down, this glass now doesn't count as a glass, this is just for counting. Red card: If your card is empty, and the card clockwise from you is empty, remain thirsty! Black card: If there is a glass on you matching card, give it to the person clockwise from you, he/she must drink it and place it on his/her card. If the glass was empty, turn that glass upside down instead, this glass now doesn't count as a glass, this is just for counting. Black card: If you card is empty, and the player counter clockwise from you has a glass on that card, that player musty drink that glass. If the glass was empty, turn that glass upside down instead, this glass now doesn't count as a glass, this is just for counting. Black card: If your card is empty, and the card clockwise from you is empty, nothing happens. Joker: If you have an empty card (remember, turned glasses does not count as glass) , take any glass from anyone, drink it at place it on an empty card. When all glasses are empty, the one with most glasses , turned or not, on his cards is the winner and most probably the most drunken person around the table as well. "is the winner and most probably the most drunken person "
That's a good idea. I'll have to remember that one. Well thank you for the invite!! I've been lurking and ya'll seem like a fine bunch to hang around with too .......lol!! Oh yea, I see you're both missing your avatars... did they get snatched in the night? are they being held hostage somewhere? Any news on the new PC? are you out of action as far as DS stuff goes for the time being? Jack I think the earlist I can get a new PC will be around July now. Been looking at the state of my finances really hard and with all the changes about to happen here I am going to delay a newcomputer until I have enough for what I want and not going with something I don't want. I did install Ds4.5 on this laptop but with the Intel onboard graphics I uninstalled it. So to answer your question Jack, nope won't have access to Daz Studio or any other software apart from Photoshop until I get a new PC. Bah that's bad news mate!